18 holes, par 72, 7029 yards. Links. Located along England’s famous golf coast, Hillside Golf Club contributes to the finest stretch of coastal links, with Royal Birkdale, Southport & Ainsdale, and Formby Golf Club just a stone’s throw away. Hillside is a true championship links golf course, once described by Greg Norman as the best back nine holes in Britain – a testament to the quality and design of the course. The course was originally founded in 1911, but was remodelled when they acquired more land in the 1960’s, primarily making changes to the back nine. Hillside is a story of two halves. On the front nine the course is relatively flat and it isn’t until you get to the back nine when you experience holes which weave in and out of giant sand dunes. Hole 11 is particularly special - a 500 yard par five with an elevated tee box and a dogleg left. 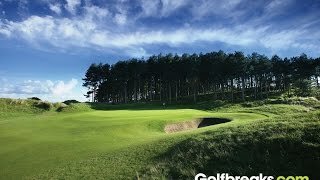 Although Royal Birkdale normally takes the limelight along the Golf Coast, do not under estimate Hillside as it is one of the best courses you are likely to play in England, and perfect for your golf vacation. Golf carts are available at £30 per round and may be reserved subject to availability. Regular pull trolleys can also be rented from the golf shop on arrival. All visitors are required to carry a current, valid handicap certificate.